The Beta 21 movement was first created in 1969 and made its debut during Basel later that year. As the highest quality quartz movement to be offered on the market, it was accurate to 5 seconds per month. Due to the movement's large and bulky size, watchmakers soon developed their own in house movements. The reference 5100 is a landmark model for a number of reasons. 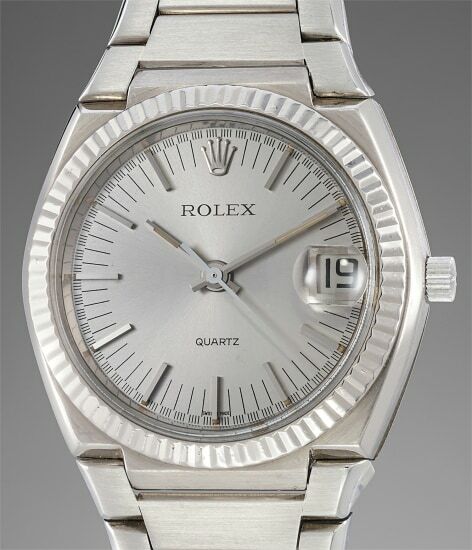 Launched in 1970, it was Rolex's first reference fitted with a quartz movement. Rolex first produced 1000 units to test the ‘Beta 21’, and all examples were sold out before the watch even hit the market. The 'Beta 21' was also Rolex's first reference to feature a sapphire crystal and quick set date function – two key innovations and components that are used in Rolex's current line of production. Cased in white gold, the present watch is exceedingly rarer compared to its siblings cased in yellow gold. To date, no more than a few handful of white gold examples have ever graced the auction market. This timepiece is furthermore preserved in excellent condition, with a crisp engraving on the case back.